Episode #326: Superman Comic Book Cover Dated March 1964: Action Comics #310! Action Comics 310, March 1964! ACTION COMICS 310, March 1964, was published on January 30, 1964. It contained 32 pages for the cover price of 12¢. The editor was Mort Weisinger, and the cover was pencilled by Curt Swan and inked by Sheldon Moldoff. - SECRET OF KRYPTONITE SIX (13 pgs. ), written by Leo Dorfman, pencilled by Curt Swan and inked by George Klein. This story was reprinted in SUPERMAN 227, June/July 1970 (a 60-Page Giant for the cover price of a quarter), published on April 14 of that year, and BEST OF DC 36, May 1983, published on February 3 of that year. - SUPERGIRL'S RIVAL PARENTS (13 pgs. ), written by Leo Dorfman and drawn by Jim Mooney. This story was also reprinted in ADVENTURE COMICS 416, March 1972, published on January 4 of that year, a 100 page Super-Spectacular with the cover price of 50¢, and in SHOWCASE PRESENTS: SUPERGIRL vol. II. Elsewhere in DC Comics, 28 titles carried the March or March/April 1964 cover date. Next Episodes: SUPERMAN FAMILY COMIC BOOKS COVER DATED MAY 1961 : PART I: WORLD'S FINEST COMICS 117 & PART II: SUPERMAN'S GIRL FRIEND LOIS LANE 25! Then we return to: SUPERMAN COMIC BOOKS COVER DATED APRIL 1964; PART I: SUPERMAN 168 & PART II: ACTION COMICS 311! Episode 325 Part II: Superman Family Comic Book Cover Dated April 1961: Superman's Pal Jimmy Olsen #52! Superman's Pal Jimmy Olsen, April 1961! Download Episode 325 Part II! 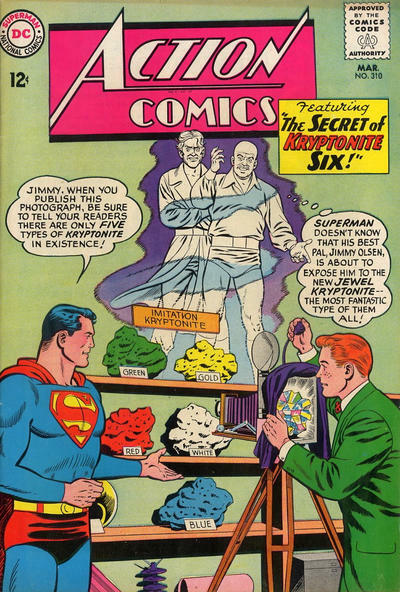 SUPERMAN'S PAL JIMMY OLSEN 52, April 1961, was published around February 16, 1961. It contained 32 pages, still for the cover price of a dime. The editor was Mort Weisinger, and the cover was pencilled by Curt Swan and inked by Stan Kaye. It featured the issue's third and final story. All three stories in this issue have been reprinted in SHOWCASE PRESENTS: SUPERMAN FAMILY vol. IV. - THE SPECTER OF THE HAUNTED HOUSE (9 pgs. ), written by Leo Dorfman, pencilled by Curt Swan and inked by Stan Kaye. - THE PERILS OF JIMMY OLSEN (9 pgs. ), writer unknown, was pencilled by Curt Swan and inked by John Forte. 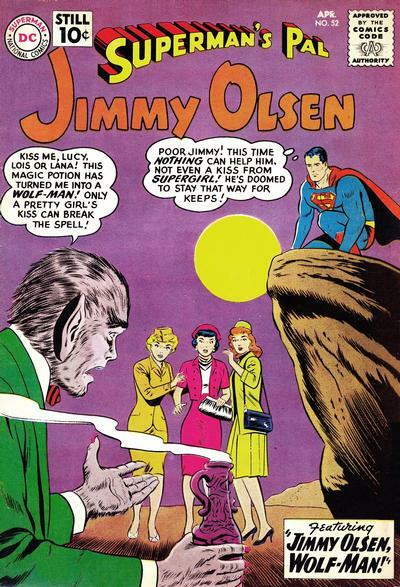 - JIMMY OLSEN, WOLF-MAN (9 pgs. ), written by Jerry Siegel, pencilled by Curt Swan and inked by Stan Kaye. This story was Siegel's 59th silver age Superman family story, and his 99th overall which we have covered on this podcast so far. Elsewhere in DC Comics, 28 titles carried the April or April/May 1961 cover date, according to Mike's Amazing World Of Comics. Next Episode: SUPERMAN COMIC BOOK COVER DATED MARCH 1964: ACTION COMICS 310! Then we will return to the: SUPERMAN FAMILY COMIC BOOKS COVER DATED MAY 1961: PART I: WORLD'S FINEST COMICS 117 & PART II: SUPERMAN'S GIRL FRIEND LOIS LANE 25!